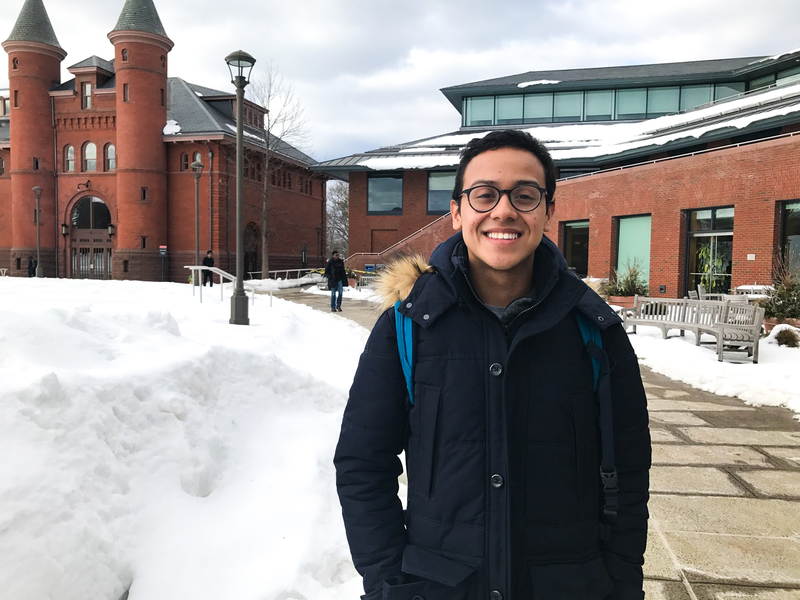 If you’ve taken a math class at Wesleyan, there’s a high chance that Michael Ortiz ’17 has been your TA. As a Math and American Studies double major, Michael is a very visible presence on campus, hard at work in the multiple things that he’s involved in. The Argus sat down with Michael in Usdan, where he talked about his professional Pokémon playing career, his crazy TA stories, and what he hopes for his future. The Argus: Why do you think you’re a WesCeleb? Michael Ortiz: I often think that I’m more infamous than I am famous. I think it’s just a matter of like, visibility. I think I just do so much around campus, and I’m just in like so many different social spheres at Wes. It’s kind of inevitable that people will know who I am and what I do. I think I’ve kind of just made a name for myself as a hard worker, and people expect that and acknowledge that. A: What are some things that you do? MO: I’m kind of all over the place. I work at the Sustainability Office… I’m a TA in the math department, which is how I know so many other people. I’ve TA’d, I’d say, almost 200 people at this point. I work as an academic peer advisor, so I work closely with Bennett Hall, so they all know me. I’m also involved with first-gen and low income student groups… I’m a part of Ajúa Campos, which is the Latino student association. And then just being a Math and American Studies double major, those are two really big majors so just meeting a lot of people in there. I feel like I’ve made my mark as a scholar in both of those fields, so I’m very recognized. A: Why Math and American Studies double major? MO: I came in as an English and American Studies [major]. I was a big fan of literature; I was a big reader in high school. My mom was worried I wouldn’t get a job after graduation, she was like, ‘English isn’t gonna get you a job after graduation,’ and I was like, ‘Fine.’ So I decided to double-major in American Studies and Econ. So I took ECON 110 and I took calculus, I was profoundly bored in ECON110. I thought it was the easiest class I’d ever taken. It was just like, I couldn’t imagine doing it for the next four years. I really enjoyed calculus and I wanted something hard and challenging, so I just kept going. I took multi, and discrete, and I did pretty well so I thought I guess I’m going to be a math major. And American Studies has always been my passion. A: What are some of your craziest TA stories? MO: I’ve had the tense ones, where at a TA session, a student will be like, ‘I think you’re wrong,’ and then they don’t know how to do a derivative so I’ll just prove them wrong. I had to call P-Safe on one of my students because they were very intoxicated… I’ve hooked up with one of my students, it’s been bad but who cares you know. Anything you can imagine, I’ve seen them at parties, I’ve taken shots with them, I’ve seen them hooking up with other students in my class, and I’m just like, ‘Oh my god, the drama.’ Break-ups, and all that good stuff. It’s been a long time in the department. A: What are your plans for after graduation, and has that changed recently? MO: I’m going to be working, full-time, at Booz Allen Hamilton in D.C. which I’m really excited about. And I kind of envisioned that being a stepping stone to pay off student loans, learn to be on my own for a bit before going back to grad school. But, I’ve always had these conversations in my head. With the recent turn of events, and with my family’s situation within the new political framework in this country, I’ve decided grad school isn’t where I need to be right now. So I’m looking into law school, where I can do a lot of the theoretical work I’m used to do doing, a lot of just reading and critical engagement and analysis, but I could do it in a position where I can help people, which I don’t think I would be afforded in graduate school.… I’ve been incredibly blessed and privileged to be here, and to have so many opportunities, so what I can do is pay it forward. And going to law school and specializing in maybe immigration law, maybe constitutional law or maybe civil rights law, I don’t know yet, whatever kind of ends up being what I like, but I know I’ll be in a position to effect change. A: So you’re looking to be a lawyer? MO: Yeah, I’ve been volleying back and forth. Some of my friends are like, ‘You’re really argumentative, you should totally be a lawyer.’ But I get stage fright. Sometimes I’m just like, maybe I should be a legal scholar, be the next Kimberley Crenshaw, who wrote one of the most influential law papers in the past 30 years. I’m hoping those kinds of questions will answer themselves as I’m learning the material and learning in school. I think I could have an effect and make a difference in either capacity. Not only because I would have the tools, but I know I’m driven and passionate about what I’ve been doing…. I want to use that attitude moving forward, and use it for some good. Because we all know we need some good right now. A: What do you in your free time? MO: It’s weird because I never find myself with an hour of doing nothing. Everything is structured. Even when I go running, which is one of my favorite past times, it’s because I’ve given myself an hour in my schedule. In those scheduled blocks of time I don’t do work, I like to go running. It’s really relaxing and helps me keep focused… I really like watching Bad Girls Club fight videos on YouTube. It hypes me up when I’m doing work and I’m kinda tired, I’ll watch a video of people beating each other up and fighting, and I’m like, ‘Michael, you got this…’ I like to read Teen Wolf fan fiction, but I do love reading me a good romance story. Oh and I play Pokemon. A: Right! So tell me about your Pokemon experience. A: What are your thoughts on Pokemon Go? MO: Pokemon Go is for posers. I refuse to acknowledge it as an actual Pokemon game. I feel like the people who are in love with Pokemon Go are like, ‘Oh my god, the nostalgia.’ But didn’t actually play Pokemon when they were kids. They just recognize it as a cultural icon…. It’s not just a game, it’s a strategy…. Pokemon Go, I refuse to get into it. A: What’s your social activism experience like at Wes? MO: I feel like it’s a weird thing for me, talking about activism, because I don’t consider myself on the front lines. I’m very bombastic in nature but I’m not really comfortable with the lime light. A lot of my work within activism has been inspiring other people to talk and be active. I’m a theorist. I don’t look for application, but I look to understand why things happen.… In that capacity, I’ve inspired a lot of people to take action, I’ve counseled a lot of people and been a voice of support for students of color, underrepresented students, and I feel like that in itself is a form of activism. I don’t have to be the one marching, as important as that is. I’m the one in the background, telling that one black girl that she can be a math major, or telling that Latino kid that he can be a theorist, and shouldn’t listen to his advisors when they tell him he shouldn’t major in this or that. I think I would consider that my proudest achievement here: helping disrupt what I consider as an institution or what we consider the norm. I’m helping the people breaking into these worlds and spheres. Not to say I haven’t involved in protests—I do a lot of work with Ajúa Campos, I was at the march following the election. I’ve done that kind of work, and that’s also been exciting but I think I shine most when I’m helping someone else, when I’m encouraging someone else, and being a cheerleader to other people.